John Watts holds a Master’s Degree in Entomology from the University of Florida with a specialization in insect husbandry. His professional career in live butterfly exhibition began at the Cockrell Butterfly Center at the Houston Museum of Nature and Science, before moving on to the Butterfly Pavilion and Insect Center in Westminster, Colorado and, finally, settling in Dallas. 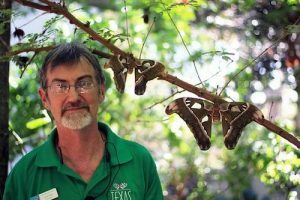 John is an avid gardener for both food and wildlife and readily shares his expertise as an entomologist at the Texas Discovery Gardens. Get on your hands and knees! This walk will introduce you to the myriad of little creatures that run the planet. Join John Watts, entomologist at Texas Discovery Gardens, as he explains the interconnections of the insects and other arthropods on the prairie with the ecosystem as a whole.